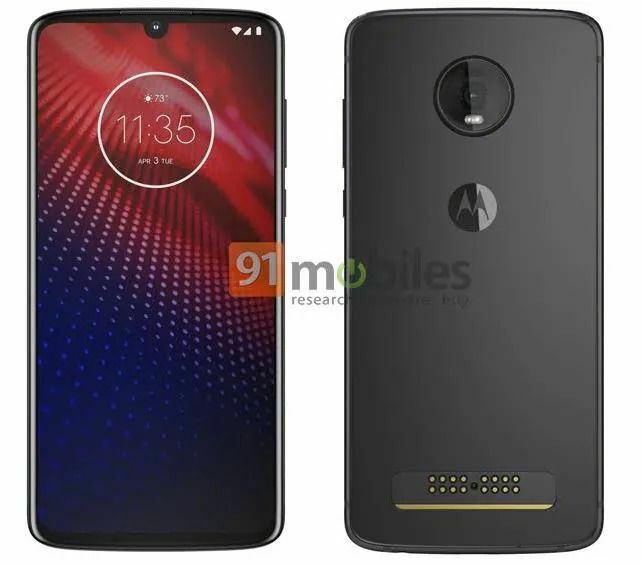 Motorola’s Moto Z4 phone has leaked, and while it isn’t much of a surprise that the company would make a fourth iteration of its flagship Android phone, it’s the first indication we’ve seen that its Moto Mod initiative may still be alive and kicking — because you can clearly see the copper contacts for its modular Moto Mods accessories on the back of this alleged phone. The release of new Moto Mods has slowed over the past couple years, so much so that it was unclear if the initiative had a future. After all, the last big wave of new Mods came along with 2017’s Moto Z2 Play. Since then, a promising fold-out keyboard developed by a third-party company was canceled in 2018. In an interview with Engadget at the time, Motorola insisted that it would continue working on Mods for the foreseeable future. But other than the 5G Moto Mod, which is now available for preorder and only compatible with Verizon’s yet-to-launch consumer 5G network, we’re not seeing any indication that another big wave of Mods is coming. So, it’s possible that the Moto Mods attachment point may exist simply to appease past customers instead of attracting new ones, but we’ll have to wait until more information leaks out to get a bigger, better picture. A few other rumored details have surfaced from publication 91mobiles. The 2019 model may use a Snapdragon 855 processor, which would go a long way to make amends with phone enthusiasts who felt burned by last year’s Moto Z3. It used the older Snapdragon 835 while other flagship phones opted for the Snapdragon 845. The Moto Z4 pictured in the leak appears to have a teardrop notch, new to the Z line but similar to the one found in this year’s Moto G7. With regards to the lack of a visible fingerprint sensor in the photo, Moto may opt for an in-display fingerprint reader instead of embedding one in the side of the phone, which it did with the Moto Z3. When he reviewed the Z3 last year, Chris Welch said that the side-mounted reader was “awkward to use,” and while an in-display option might reduce the awkwardness, it may not necessarily be better. The Samsung Galaxy S10’s in-display solution ended up being “slower and more finicky” than what it used before, though Moto may figure out a way to improve it. In recent years, new smartphones from companies like Apple and Samsung have seemed like iterative improvements rather than game-changing releases. But at Mobile World Congress, brands like Huawei and Nokia debuted new phones with unconventional features and new form factors. It’s unclear if any of these new phones will prove successful, but it’s a sign that tech companies are seriously thinking about what comes next after the modern smartphone. When Steve Jobs unveiled the first iPhone more than 10 years ago, he famously showcased its ability to function as three devices in one: a phone, an iPod, and an Internet communicator. But the breakthroughs that occurred in the years following the iPhone’s debut were almost just as impactful the launch of the App Store in 2008, the emergence of larger-screened devices following Samsung’s first Galaxy Note in 2011 , the rise of touchless voice controls with the launch of Siri in 2011 followed by the original Moto X in 2013, and the iPhone 5s’ TouchID home button that made passcodes feel obsolete in 2012. Yet it’s become increasingly difficult if not impossible to pinpoint new smartphones that have made a similar impact. New models introduced by the industry’s biggest players like Apple and Samsung have felt iterative more than revolutionary in recent years. For example, the biggest differences between the top-of-the-line iPhone Xs Max launched by Apple in September compared to 2017’s iPhone X are its bigger and sharper screen, improved water-resistance, more sophisticated processor and enhanced camera improvements that are appreciated but certainly don’t fundamentally change how smartphones are used. The same can be said for Samsung’s new Galaxy S10 , which offers a superior screen that the company claims offers more accurate color representation than its predecessor and a refreshed design along with a better camera. But if the news announced at this year’s Mobile World Congress conference is any indication of the future, it looks like smartphones are about to change in a fundamental way. New unconventional phones launched under the Huawei, Energizer, and Nokia brands have made an appearance at the convention this week, boasting features and form factors that are at least exciting and refreshing if nothing else. Huawei’s new foldable phone, the Mate X , features a flexible wraparound display that makes the phone resemble creased paper when folded, while Avenir Telecom’s Energizer P18K Pop packs a massive 18,000 mAh battery that gives it 50 days of battery life when in standby mode. HMD Global’sNokia 9 PureView smartphone has a staggering five cameras on its rear. And just ahead of Mobile World Congress, Samsung unveiled its first folding smartphone, the Galaxy Fold , which can run three apps on its screen simultaneously. The slowdown in smartphone innovation has seemingly been reflected in sales as well. Global smartphone sales stalled in the fourth quarter of 2018, up just 0.1% compared to the same quarter in 2017, according to Gartner . A team of analysts at UBS led by David Mulholland recently estimated that smartphone units will decline by 5% in 2019, citing a change in consumer buying patterns and lack of innovative features. “We recognize new features always take time to gain attention in the minds of consumers, but if we look at some of the key new features in the last recent years like FaceID and artificial intelligence, they have been much slower at gaining interest in comparison with features like fingerprint sensors and dual-camera solutions,” says a UBS note published on February 14. That’s not to say these new offbeat devices will play a role in boosting industry sales, and they may not be emblematic of the next major evolution of the smartphone. After all, the feature phones with retractable keyboards that dominated the early 2000s like the T-Mobile Sidekick don’t look anything like the sleek rectangular touchscreen smartphones we use today. But the Sidekick and others set the stage for an era in which we use our phones for much more than just texting. These new foldable devices may similarly lay the foundation for whatever comes next. While what exactly that entails remains unclear, one thing is for sure such devices are no longer just prototypes or concepts; they’re on the horizon. Spyce is a new restaurant in Boston powered by a robotic kitchen that cooks your food in three minutes or less. MIT graduates Michael Farid, Brady Knight, Luke Schlueter, and Kale Rogers created the robotic technology and restaurant concept while in college. Known as the “Spyce Boys”, the founders were inspired by their experiences as hungry student-athletes on tight budgets. The robotic kitchen is actually designed to prepare the food, cook it, and even clean up. Following is a transcript of the video. Spyce is located in Boston. Their robotic kitchen cooks your food in three minutes or less. The fast casual restaurant was created by four MIT graduates. Michael Farid: As robotics-obsessed engineers, we set out to create a new and efficient way of cooking food. The robotic kitchen serves salad and grain bowls. Here’s how it works. You order from an electronic kiosk. Spyce offers vegetarian, vegan, and gluten-free bowls. There are 7 customizable options. A screen displays your order while the robotic kitchen gets to work. Luke Schlueter: Our woks cook by constantly tumbling your food, which provides a really nice and even sear. They’re heated with induction and we have temperature control to perfectly cook your meal every time. The only human in the kitchen is the “garde manger” or “garnish employee”. They add your toppings. The bowls are $7.50 each. The founders were inspired by their experiences as hungry college students. Brady Knight: From our humble starts in our fraternity basement, we developed a prototype that really sort of proved we could build something that can create delicious, high-quality meals. Spyce ‘s robotic kitchen is designed to cook, serve, and clean up. After creating the robotic kitchen, the founders focused on food quality. Kale Rogers: We knew we needed some culinary excellence, to really bring this restaurant concept to life. The founders recruited Michelin-starred chef Daniel Boulud to be Spyce’s culinary director. consistency, taste, and also freshness to the preparation. Currently, Spyce only has one location. So you’ll have to visit Boston to try food from a robotic kitchen. Are robots the future of the food industry?